CARRIE UNDERWOOD ANNOUNCES NEW “CRY PRETTY 360” TOUR. 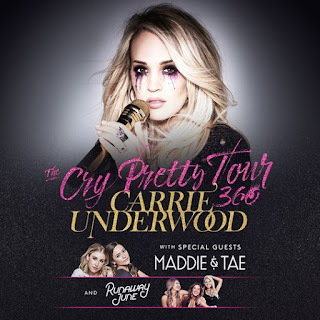 Seven-time Grammy winner and Pollstar’s three-time top female country touring artist, Carrie Underwood, will launch a new arena tour, The Cry Pretty Tour 360, in Spring 2019. Sponsored by CALIA, the new tour will kick off on May 1st in Greensboro, NC, and will play 55 arenas across the U.S. and Canada and be promoted by AEG Presents. She will be joined on tour by special guests Maddie & Tae and Runaway June. Carrie made the announcement this morning in a personal video to her fans. Citi® is the official presale credit card for Carrie Underwood’s “The Cry Pretty Tour 360” for 2019. As such, Citi® cardmembers will have access to purchase presale tickets beginning on Monday, August 13th at 12pm until Thursday, August 16 at 10pm through Citi’s Private Pass® program. For complete presale details, visit www.citiprivatepass.com. Carrie is set to release her eagerly-anticipated new album, Cry Pretty, on September 14th. Cry Pretty will be her first studio album on Capitol Records Nashville and marks the first time she has co-produced her own album. The lead single and title track, “Cry Pretty” debuted as the #1 song in the U.S. all-genres. The song also topped download charts in 38 countries around the world and amassed over 3.5 billion social impressions across 66 countries during its week of launch in April, which was culminated with a show-stopping performance on the “2018 ACM Awards” telecast. Carrie co-wrote the powerful single with Hillary Lindsey, Lori McKenna, and Liz Rose (aka The Love Junkies) and co-produced Cry Pretty with fellow writer/producer David Garcia.